The index opened flat and stayed in a narrow range only to see huge swing in the last hour of trade to close positive for the day at 8632.60, gain of 3.45 points. The broader market was weak with 735 advances to 866 declines. Range till expiry at 8450-8750. 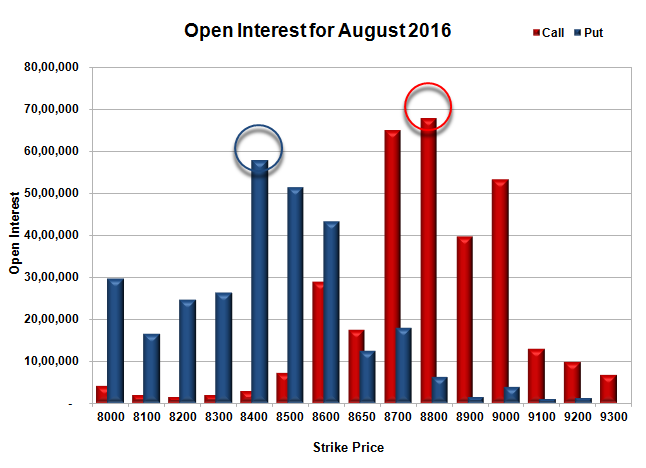 Call option 8600 added 0.99 lacs OI with profit booking at 8800 and above strike prices. Put option 8650-8600 added 3.26 lacs OI with profit booking at 8500 and below strike prices. 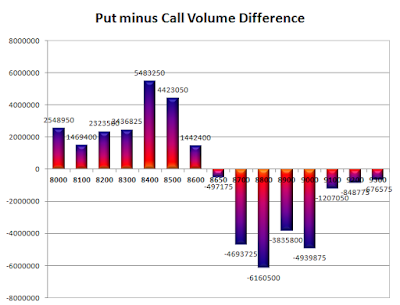 Nifty Open Interest is at 1,23,51,375 down by 58,12,125, whereas next series added 74.27 lacs with no change in price, most probably 100% roll-over with huge long/short build-up. Bank Nifty Open Interest is at 18,10,120 down by 1,03,840, whereas next series added 1.60 lacs with increase in price, most probably 100% roll-over with long build-up. FII’s sold 10155 contracts of Index Futures, which includes net 7303 contracts long build-up and 17458 contracts short build-up, with increase in net OI by 24761 contracts, includes 148843 longs to 158998 shorts for the day. 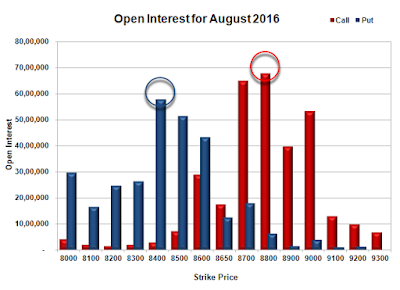 FII’s Index future open contract as on date is 325791 Longs to 89009 Shorts, Net long 236782 contracts. Initial support stays at 8600, with OI of 43.36 lacs and below that at 8500 with OI of 51.38 lacs. 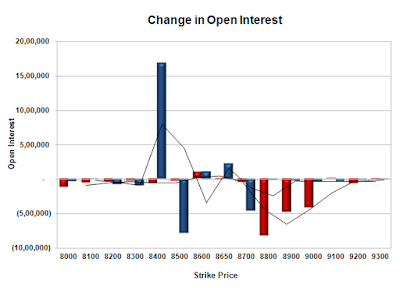 Initial resistance at 8700, with OI of 64.94 lacs and above that at 8800 with OI of 67.91 lacs. Day Range as per Option Table is 8568 - 8675 and as per VIX is 8570 - 8695 with 8618 as the Pivot.